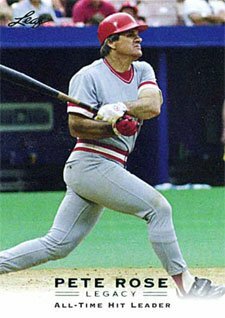 No matter your opinion of Pete Rose the person, Pete Rose the ballplayer is one of the best-ever. 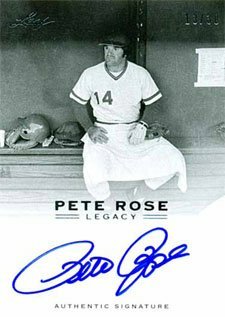 Leaf is bringing both Rose the person and the player to the table for 2011 Leaf Pete Rose Legacy Baseball, one of the most unique baseball card sets in a long time. Offering a Rose autograph in every single-pack box, the big draw is the inscriptions that many will come with. 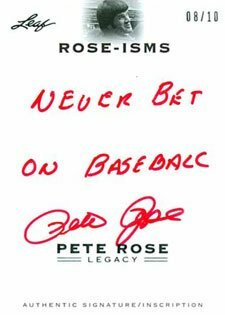 They cover on-field accomplishments, baseball thoughts, personal notes and provocative statements about Rose's notorious history with gambling. Boxes come with five base cards and one autograph. The base set has 60 cards. 60-card base set cover Rose's playing career and personal life. 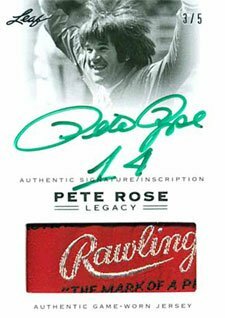 One Pete Rose autographin every pack. Rose-isms inscribed with famous quotes (numbered to 10, 5 and 1). 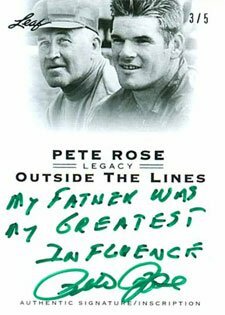 Outside the Lines include inscribed off-field thoughts from Rose (numbered to 10, 5 and 1). Rose shares his thoughts on his Cincinnati teammates in The Machine (numbered to 5 and 1). Career Highlights highlight inscribed stats (numbered to 10, 5 and 1). Nicknames (numbered to 10, 5 and 1). Auto/Bat Pieces and Auto/Jersey Swatches combine signatures with game-used memorabilia (numbered to 10, 5 and 1). Parallels numbered to 30, 10, 5 and 1. 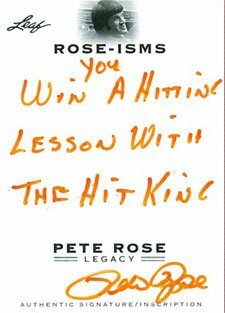 One collector will win a trip to Las Vegas and get a personal one-hour batting lesson with Rose. 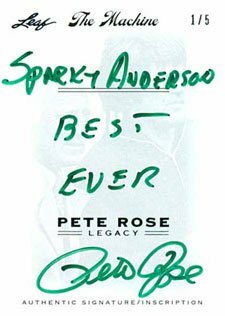 The redemption card is personally inscribed by Rose. The prize includes airfare. IF you’re rating this product based on the individual, in comparing him to one of MLB’s quiet heroes, you’ll do a disservice. Truthfully, Pete Rose is OUT of baseball because of…Pete Rose. Still, it’s nice to pay some homage to a ballplayer who gave 110% every game, and the man does have the most games played, most at-bats, and most base hits (4,256) in MLB History. Doesn’t that account for something positive, regardless of what a few bitter old ballplayers think? Good product, and Mr. Rose needs to get HIS act together, too. 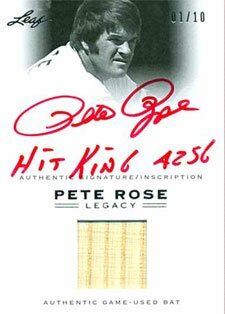 Just opened a factory sealed blaster box of Leaf The Living Legend Pete Rose and it was guaranteed to have a auto card in top loader in box and to my surprise when opened I did not see an auto card anywhere. got screwed don’t buy this product. Could not get ahold of anybody from Leaf to talk to. 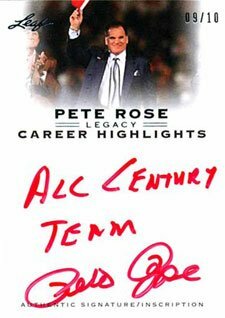 Been looking for a hard signed Rose card for a while and stumbled on this product. $50 US got me a nice magenta signed black printing plate /1. Guy belongs in the hall of fame, he should be recognized for his on field accomplishments, which this set highlights quite nicely. All autos are on card which is a selling point for me, I know I lucked out by pulling an auto’s printing plate but from what I have seen, even pulling a common /30 is still nice. This product is underrated and seems to flown under the radar.